My baby is due in less than ten weeks and the realisation of this has made me think about preparing for a new baby and doing a big spring clean. I always think that Spring is the perfect time to air out the house and do those jobs we don’t always get a chance to do day to day. Things like cleaning the oven, on top of the cupboards and around the skirting boards. Doing a big spring clean makes me feel like I’m decluttering and getting on top of things which will mean once the baby comes I can relax. To help me with this mammoth task I have been putting some Marigold products through their paces! 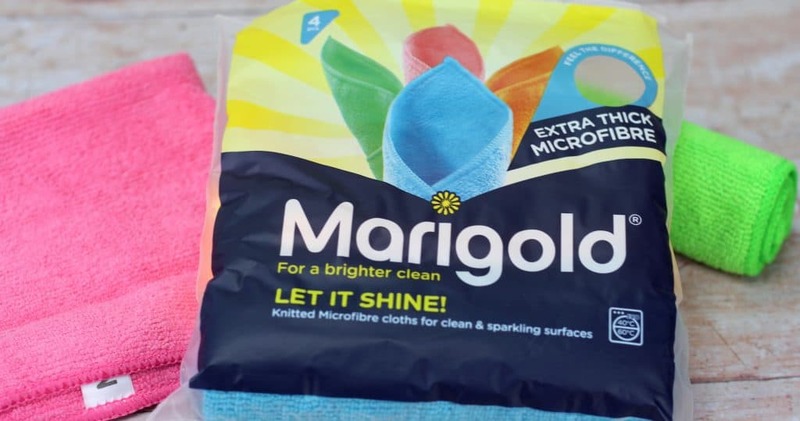 Marigold are famously known for their rubber gloves but they also have an extensive range or cloths, sponges and scourers which will make light work of even a big spring clean. 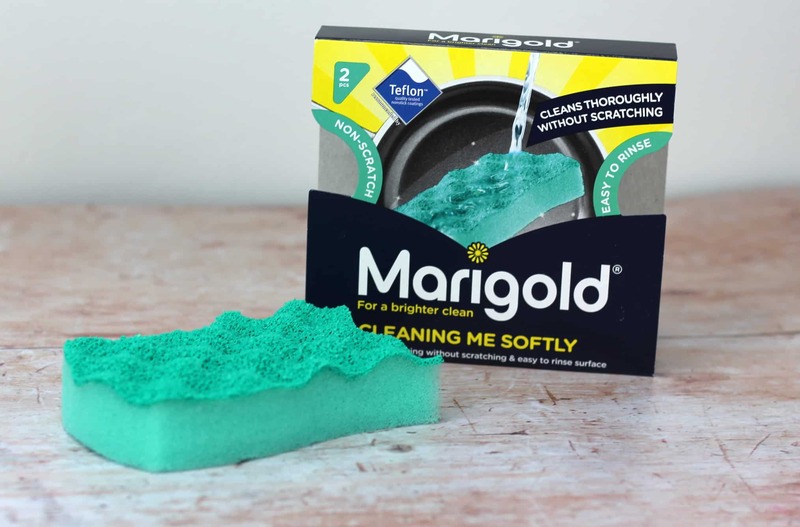 If you haven’t tried any of the Marigold range then now is the perfect time to give it a go because they currently have a ‘Try Me Free’ promotion. You simply purchase a Marigold cloth or scourer that contains the orange promotional sticker then write a review of 15 words or more. Post the review, the promotional sticker and the original receipt to Marigold and you will receive your refund. Find out full details and the address to send your review on the Marigold website here. It’s easy to read how much I like the Marigold range but why not find out for yourself? This handy cloth is perfect for wiping down the sink, bath and shower to help prevent mould, mildew and lime scale. I like it because it gives a streak free finish so is perfect to use on a daily basis to keep everything looking ship shape. I keep one in the bathroom which is perfect for giving everything a quick wipe down at the end of the day or just before you have visitors! After a few uses it can be washed in the washing machine and used again and again! Even after a number of uses and washes the cloth is still going strong and is showing no signs of needing replacing. Another item I often use in the bathroom but if I’m honest is great for use anywhere is Cleaning Me Softly. This tough scouring sponge removes built up dirt without scratching the surface which is perfect for use on those more delicate areas. You can literally scrub and scrub at dirt and marks without causing scratches or damage. In the past I never used microfiber cloths but they are now a staple in my cleaning kit. Marigold has produced some wonderful extra thick microfiber cloths which are perfect for a multitude of uses around the home. Each cloth is a different colour so I often will assign a colour to a particular job such as blue for bathroom, green for dusting and pink for kitchen. These cloths are great for using wet to wipe down surfaces or dry for polishing and dusting. After a few uses you can simply wash them in a washing machine and use them again and again. 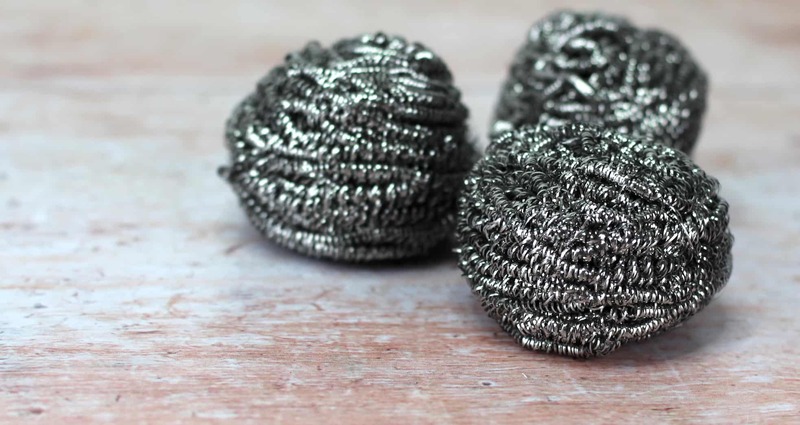 These heavy-duty rust proof scourers come in a pack of three and are perfect for use on burnt on food and grime. They are perfect for use on the oven, grill or barbecue. I’ve found even after some heavy duty scrubbing they don’t fall apart and they are tough on burnt food and built up dirt. This is my staple kitchen cloth and it can be used for almost any task. It’s great as a washing up cloth and perfect for wiping down the kitchen sides and cupboards. If you are doing a big spring clean and want to use bleach then this cloth is bleachable making it ideal for use with stronger cleaning products during a deep clean. Once you’ve finished just pop it in the washing machine up to 60 degrees and reuse again and again! I used to use a lot of kitchen roll because of its absorbency but that is neither cost effective or good for the environment! Oops Away is a great kitchen roll alternative as it is great for mopping up spills, is stronger than kitchen roll and can be washed in the washing machine once used. This is a great lightweight cloth that can be used anywhere in the house. I love this scourer sponge because it’s easy to rinse, long lasting and flexible. It’s perfect for use on the grill pan or on pots and pans where food has burnt on and It doesn’t matter how much I use it the scourer retains its shape. This non-woven super absorbent cleaning cloth comes in a pack of two. It contains added microfiber for extra cleaning power and can be used wet or dry for multi-use around the home. It has added odour stop technology which prevents bacteria build up making it more hygienic and prevents smells. This Sponge is very absorbent and thick making it ideal for mopping up spills. I love that it is strong and can be used to scrub at surfaces without breaking up or showing damage. 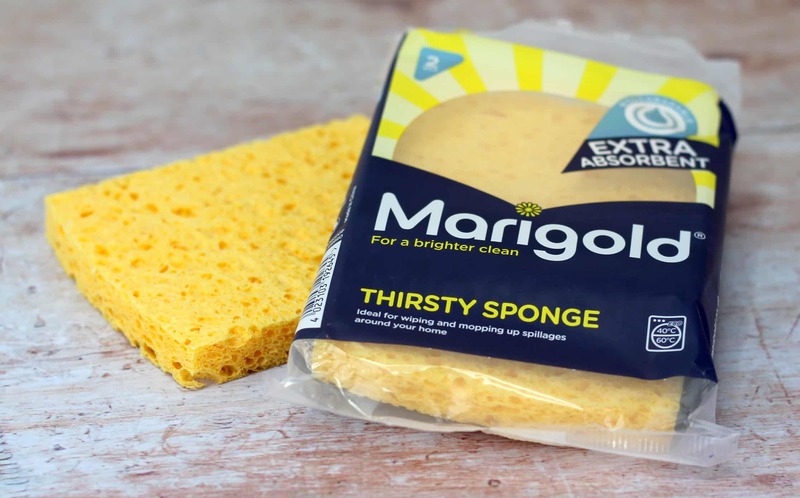 Like many of the other Marigold products the Thirsty Sponge can be washed in the machine up to 60 degrees for use again and again. One of the most used Marigold products has to be the Clean & Gleam. A double-sided sponge with one side as a scourer and the other as a cloth. This multi-use sponge makes easy work for those big spring clean jobs around the house as you only need the one item as it is multi use! The scourer side is tough on stubborn marks and dirt and the cloth side wipes down surfaces with ease. Make A List – Before I even start cleaning I make a list of all the jobs I want to get done. By doing this I feel more organised and it means I don’t miss anything! – For help with this download my free spring cleaning printable here. Air It Out – If the weather is nicer outside then turn off the heating and open the windows to let the air circulate. Take Your Time – A big spring clean is a big task but it doesn’t need to be done in one day spread it out over a week or two so you don’t get overwhelmed. Donate, Throw Out & Declutter – Make sure that as you go you are considering decluttering items that are no longer used or needed. Over time we start to horde things so it’s a good time to assess what we actually need. Big Spring Clean – How did we do? Doing a big spring clean is a huge task. It’s certainly not a task I look forward to and more one that just needs to be done. Having cleaning products, you can rely on and that get the job done is essential. 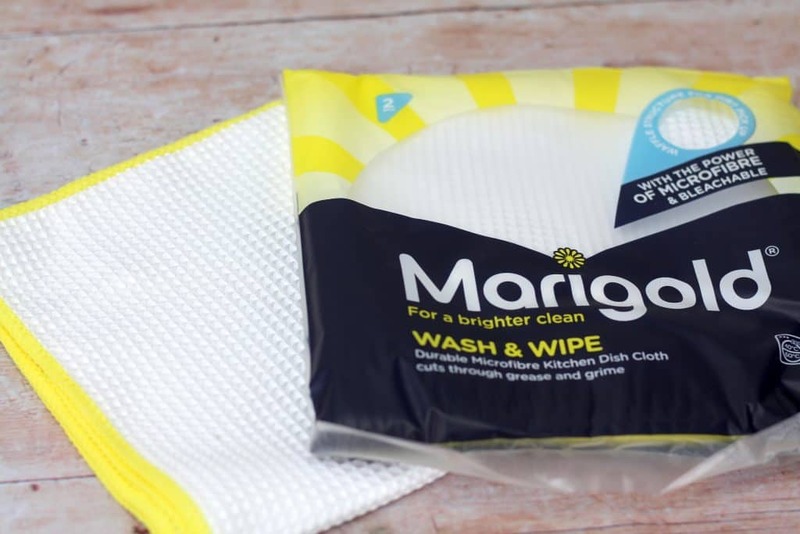 I’ve used some of the Marigold range before but this time I have really put each item through its paces. I’m really impressed with the usability and functionality of each item and if I’m honest it has made some of the more gruelling tasks easier. Honestly, I would say these products are reliable and they get the job done which as a busy, pregnant mother I am grateful for. *Marigold kindly sent these items on gifting basis in return for an honest review. All words, views & opinions expressed in this post are honest and my own. For more information on any of this please visit this page. The Marigold brand reminds me of my mum as she would swear by their rubber gloves when I was younger. I didn’t realise they had such a large range. I’ll have to pick some up! I’ve used those scrunchies before they’re great! 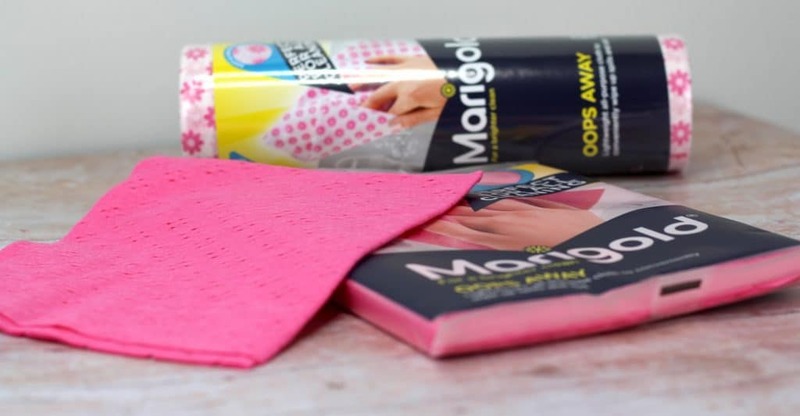 We couldn’t live without Marigold gloves but I didn’t know they had such a wide range of other cleaning items so it was great to see the range in this post. Time to stock up for the big spring clean!